Sunspel announced that it has provided a range of luxury underwear and t-shirts for Daniel Craig to wear in SPECTRE. As makers of the Riviera Polo Shirt designed for Craig in Casino Royale, Sunspel also created a special edition of this now-iconic style to celebrate the upcoming release of the latest Bond film. Available for a limited time only, the polo comes in a brand new colour: Spectral grey, and is cut from the original block tailored to Craig’s exact measurements. 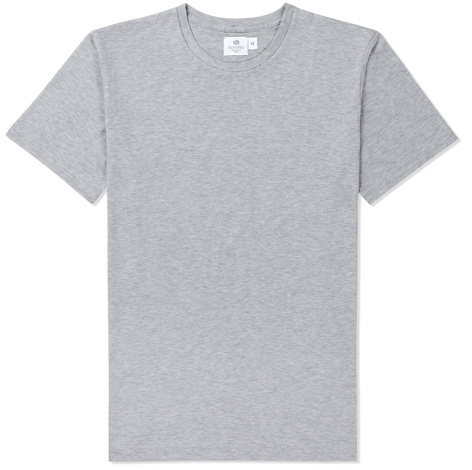 Sunspel announced that it has supplied the Sunspel Stretch Brief, the Stretch Boxer Brief and the Riviera Crew Neck T-Shirt (the same model shirt seen in Casino Royale) for Daniel Craig to wear in SPECTRE. It is not yet known if any of these products will be visible in the final film. The connection between Sunspel and Bond dates back to 2006 when Lindy Hemming, the Academy Award winning costumier, was tasked with reinventing the Bond character for Casino Royale. Working from the Sunspel factory in Long Eaton, Nottingham, together they tailored the Riviera Polo – a style that Sunspel has been making since the 1950s – to best suit the modern man of action and style. The resulting garment has a slim fit, and slightly shorter sleeves than your average polo: ideal for accentuating a muscular physique. The Riviera Polo has been made to these amended specifications ever since. As is true with all Sunspel products, fabric is paramount to fit. The Polo is crafted from a unique cotton mesh fabric invented by Peter Hill, the grandson of the company’s founder, Thomas Hill. Affectionately referred to as Q (for Quality) 75, it was developed for keeping cool in the hot summer sun of the Italian Riviera. Knitted on lace machines - a nod to the Sunspel factory, which is located in the heart of what was once the lacemaking area of northern England – Q75 is softer, lighter and more breathable than cotton pique, which is traditionally used to make the polo shirt. In the same film, Bond also wears a white Riviera V-Neck T-Shirt and the melange grey Riviera Crew-Neck T-Shirt. Sunspel and Hemming worked together again in 2011 when Hemming was involved in the exhibition Designing 007: Fifty years of Bond Style. On this occasion they recreated the swim shorts worn by Sean Connery in the early films of the 1960s. The shorts were such a success that later that year Sunspel launched their first line of swimwear. 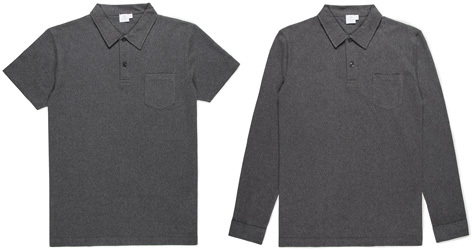 Sunspel is an authentic English heritage brand founded in 1860. Sunspel make exceptional quality, everyday clothing from beautiful fabrics. Iconic products include the earliest English T-Shirt, the original English Boxer Short and the Riviera Polo Shirt. Sunspel still has its own factory based in Long Eaton near Nottingham, where clothing is crafted from the world’s finest quality cottons. I wonder if the Riviera crew neck will be the same as the Casino Royale version? I have several Riviera crew necks, the original and then two later version. It is pretty clear looking at them that they are not the same t shirt.